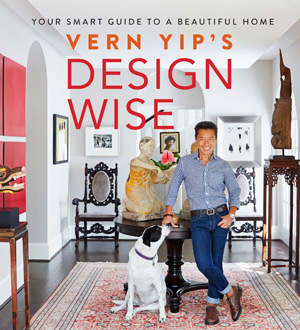 Design Wise (September 2016) – Designer and TV personality Vern Yip partnered with Omega Cabinetry to renovate both his Atlanta and New York City kitchens in his first book on room design, "Design Wise: Your Smart Guide to a Beautiful Home," released the week of Sept. 19-23. Yip's book teaches key principles for designing and decorating each room in your home. Yip's modern Atlanta kitchen features an open layout painted black and white with green accents, with added drama from black cabinets. It features Omega’s Clio cabinet door style in Maple with a Black opaque cabinet finish. In his New York kitchen, Yip chose a traditional look and opted for dark wood complemented by white surfaces. The kitchen is outfitted with Tarin cabinet doors in Walnut with a Kodiak dark brown cabinet stain. Images of the two kitchens can be found between pages 28-38, 78-128 and 175-262. Yip requested Omega Cabinetry as a vital part of both his Atlanta and New York City kitchens, "It was really important to me to have a cabinetry partner that gave me the utmost freedom in design choices and that specializes in creating top-quality wood cabinets. I know my cabinets will get a lot of wear and tear. I have two young kids, and kids aren't particularly careful when they open or close a door – and I wanted something that would be durable and beautiful," said Yip. Handcrafted with a personal touch, Omega Cabinetry offers infinite room design possibilities with elegant, customized cabinets that are as beautiful as they are functional. Our dedicated craftsmen hand-select the most beautiful hardwoods in North America to create each individual piece by hand, in a way that highlights its unique beauty and reflects your vision. If you can dream it, Omega can build it. Renowned designer Vern Yip of Vern Yip Designs has designed his way across America, having made-over homes and restaurants on TLC's "Trading Spaces," NBC's "Home Intervention" and on HGTV, and starring in "Deserving Design with Vern Yip," "Urban Oasis," "Design Star," "Bang for Your Buck" and "Live in Vern's House." His new book on room design, "Design Wise," is available on Amazon and at select retailers nationwide.